paul gregutt's washington wine blog – unfined & unfiltered: give me money, that's what I want! Debuting your new winery, in a crowded field, that includes neighbors who are veterans of the business, is a lot like moving to a small town. When you come into a small, well-established community as the newcomer, all eyes are upon you. You have to prove yourself. You may come in for some extra scrutiny, a bit of criticism. It will take some time to establish your rightful place, to craft solid relationships, to become a real contributing member of the place. So if my first bottle of Chateau Graygoat hits the shelves at, say, $50 or $80 dollars (and I've seen them start much higher), it had better be mighty impressive. Because there are wineries in my neighborhood who have churned out great stuff for years who are charging no more, and often less. And you know what else? Your (potential) buyers do not give a rat's patootie what your costs are! Managing your costs is your problem, not their problem. Managing your pricing is a whole different kettle of fish. And apart from pricing that is simply too high, I also quite often see pricing that just makes no sense. The relationship among the different wines being offered, and their relation to comparable wines on retail shelves, is what should determine pricing. After that, figure out your costs and manage them to make a profit. "I am not sure why people are buying those wines. I recently had a first attempt Chardonnay that was $45 a bottle and I couldn't even get more than 3 or 4 sips down. Horrible stuff and way over oaked, not even in a good way." "One of the things I love about your "five Star" rating system is the concept of LONGEVITY. No 1-hit wonders. Gotta have history; earn your stripes. "I could not agree more & it continues to happen. I can only hope the market takes care of these overpriced mediocre wines." From a fellow critic: " I am in complete agreement. I only review wines that are worth their prices. If they don't, I don't write about them." "We have all gotten the sucker punch at one point or another where we pick up a bottle because of the pure psychology of package and price point and take one SIP and start thinking about if it could even work in a reduction... that's why I have a huge phone list of good drunken wino friends - now no one has to venture into the void alone without counsel." "I'm a new winery and so glad this thread isn't about me. But what about new wineries who release expensive wines that are amazing? Shouldn't they have to pay their dues and win respect with reasonable prices?" "You mean this bottle of $75 dollar Boone's Farm Ripple is no good?" Yes! I mean, no! Well, maybe... anyway... glad to get this off my chest. And happy that there are plenty of very fine wines at great prices these days. We'll continue to put the spotlight on them in this blog. Seems there are two schools of thought out there, "At these prices we can pay down all our debt in one year." and "If we say it's $100 wine, people will believe it." I heard one winemaker say, "I don't care what you think of the prices. I think it's worth this much and if you won't pay that there are people out there who will." I agree completely, Paul. I may give a pass, depending on who is involved, to collaboration series type offerings, for pricing and the like. But to have a new winemaker, with a new brand and unproven capabilities charging $50-80 (or more) for their wines is just silly. There are so many proven winemakers that I can get amazing wines from for half those values. Not to mention I'd rather continue developing and supporting a relationship I already have, rather than start something anew with a questionable person and/or winemaker. Price is always an obstacle at first, but if someone perceives value or there is value, price is never one. 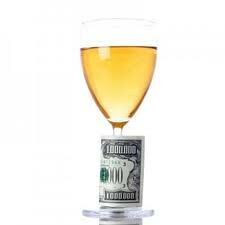 I would be willing to pay $100 for a good bottle of wine, but I wouldn't even pay $1 for a mediocre one. I agree 100%, Paul. When I have questioned pricing in the past, I had a winemaker tell me that he priced his wines based on his "competition". His competition (so to speak) was charging $50 and up for Syrah, so he thought he needed to charge the same. This was a new vinter, and believe me, he was no Bob Betz. I tried to tell him that given the down market and a glut of very good WA Syrahs going for substially less, had likely set a new price point for him to consider. This chump didn't realize that the global wine market was his "competition". Granted they are different styles, but why would anyone buy a so-so WA Syrah at $50 when they could buy the real deal from the Rhone for substantially less? (e.g. St. Cosme CdR with 100% Syrah for 15 Bucks). The list of wines and varietals that you can plug into this equation goes on and on. For consumers to buy a wine (at any price point) the value and quality need to be compelling; it is not enough to assume that the customer will swallow your sales pitch along with your wine. Everybody who HASN'T raised their prices since before 9/11 (2001) raise their hand. ...Hmmm I see one hand. Are there more out there? You go Tenor! The attempted comeback to some of the comments by one of the owners is worth a trip to the site all by itself.